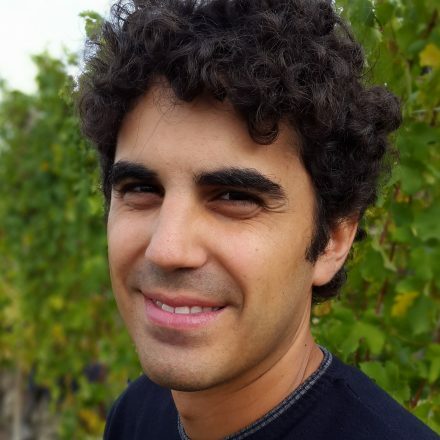 The son of a teacher from the ‘borgata’/hamlet of Albesani, close to the Barbaresco village of Neive, young Francesco Versio graduated in 2005 from Alba’s Umberto 1 wine school & in 2009 from Turin University, specialising in viti & viniculture. He worked briefly at the cooperative Terre di Barolo before joining Bruno Giacosa first as a cellarman & then as their oenologist in June 2011. His family own a tiny property of two small plots of old vines in the ‘comune’ of Neive: one in the vineyard of San Cristoforo, planted in 1969; the other, Currà, even older, lies below San Cristoforo. Both face south-west & overlook the village of Barbaresco; both were rented out until 2012. The ‘terreno’ of San Cristoforo is more calcareo/calcareous, giving freshness & perfume; that of Currà is more sabbioso/sandier, imparting a warm softness to the wine. In 2013 Francesco made only 20HL (2,600 bts) of his first Barbaresco from their two vineyards, at a yield of circa 30HL/ha, in the basement cellar of this parents’ house. He spent his earnings on a new temperature-controlled stainless-steel tank – the controlling element to be used only in emergency – & a large Stockinger botte grande. Vinification is traditional, with long macerations on the skins when the vintage allows; the wines always being bottled with approx. 25 mg of free sulphur. The 2014 vintage, produced from fruit from Neive’s San Cristoforo vineyard, was down by 50% due to the vintage & because he replanted the Currà vineyard (with 60% Lampia, 30% Michet & 10% Picotener). Vintage 2015 was also made from the single, calcareous San Cristoforo vineyard. From vintage 2016 Francesco has bought fruit from a nearby Neive vineyard, Tetti/Cotta. In 2017 he took on a small ESE vineyard in Borgata Pamparato, between Dogliani & Belvedere Langhe, at 500m asl, from which he is making Dogliani DOCG & perhaps in due course some Langhe Nebbiolo…plans are also afoot to invest in another botte grande & cement tank! …tasted Nov’18, having been bottled in March’18, finely poised, relaxed & charming violets, blackberry/pepper coulis! Fragrant, refreshing, pretty & exciting….a great debut. 2016 Barbaresco, Neive – tasted Nov’18, bottled Aug’18, only 3,500 bts made, 14.5%, with 25% of the fruit coming from Cotta in 2016, supplementing that of San Cristoforo, macerated for 35 days, aged in 20HL stockinger + 1 tonneau. Cotta seems to bring a broader, fleshier character to the sinewy San Cristoforo. So more brambly, blueberry hints on the nose, while the palate is pure San Cristoforo red coiled, limestone fruit. A fuller structure & plenty of material in 2016, compared to the more esile/ethereal 2015. 2015 Barbaresco, Neive – bottled July ’17, as per 2014 this is a single vineyard Barbaresco, San Cristoforo, from the village of Neive (W facing over looking the village of Barbaresco); the vintage was not hot like 2011, fresher with total acidity at 5.40 (vs 6 in 2014), while the quality of the skins & pips allowed a decent 18 day maceration. Tellingly, it was his first vintage making wine in his parents’ garage! Pretty pale red, the nose is tight, limestone cool, magro even, reflecting the well ventilated site & minerally-rich, poor soils; such freschezza! Lots of racy fragile/strawberries, rose petal & aranciato/orange pith, pacy; beautiful purity, limpidezza, cool crunch, stupendo! Rosewater pure. Gorgeous…alas only 1 botte of 20HL made!! !